Now in a new translation and further adaptation of the Anouilh version by director Robertson Dean, A Noise Within’s “Antigone” proves an admittedly truncated, elemental edition. Narrowed down to its essentials, the grand Greek speeches reworked to resonate with a modern audience, the power of the essential struggles of its protagonists leaps out in a way which makes ancient struggles modern. The tale remains essentially the same, though – like Anouilh’s version – it is placed in an era reminiscent of the late 1930s (Anouilh was actually writing his version as the Germans entered Paris). Oedipus is gone, his sons have fought to the death over who should run Thebes. Oedipus’ brother-in-law Creon backed one of the brothers, Eteocles, over the rebellious Polynices, and as a result has taken over as king after both brothers die in battle. To declare the rebellion dead, he has decreed that nobody shall bury Polynices’ body so that it may rot in public as a warning to all further rebels. Should anyone bury the body, that person shall be condemned to death. Which leaves their sister, Antigone, with an agonizing ethical choice. If she buries the body of her brother, she shall die. If she she leaves it there to disintegrate she shall have allowed something immoral to happen that she could have stopped. Which is more important, her life or her conscience. For Antigone this is no choice at all, but to those around her more versed in political expediency, the choices she wants to make are either idiotic or tragically pointless. Yet, she knows what she believes is the right thing to do. 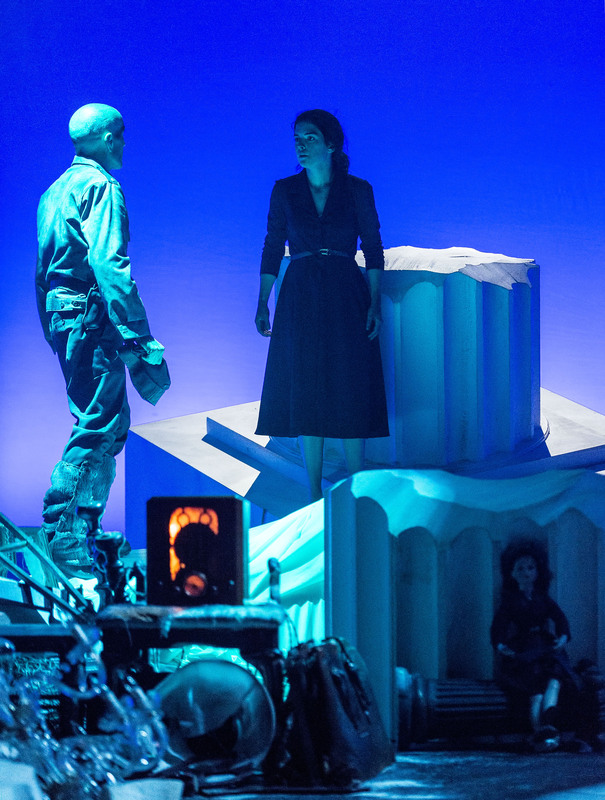 This production jumps to vivid life due largely to Emily James’ impressively, passionately intense Antigone. Small, and physically fragile, James’ heroine is vibrantly resolute – absolutely positive she is taking the only action possible, and yet equally sure it is an action which should harm no other. Riveting from start to end, she is impossible not to watch. Eric Curtis Johnson makes Creon the consummate politician, even in exhaustion seeing life as a negotiation and honor as relative, at least until it hits too close to home. Brick Patrick moves Creon’s son, Antigone’s fiancé, from a casual nobility to a resolute passion as his world increasingly wraps around the fate of his intended. Inger Tudor makes the chorus – a character Dean has given a much larger roll, in that she speaks the words of several characters other than her own – the voice of reason as she sets and expands the tale beyond the intimate palace space. Smaller parts are also impressively done. Lorna Raver fusses well as the shaken nurse. As Antigone’s more elegant sister Ismene, Kyla Garcia becomes a balance to the title character’s determined single-mindedness, as she ranges from fear to compromise with little effect on the outcome. Stephen Weingartner plays the parts once handed to three separate guards – the realist of the piece – whose focus is not on the reason for war or the ethics of Antigone’s actions, but on how it will affect his future in his chosen occupation. All of this plays against Frederica Nascimento’s junk pile of a set, complete with a radio whose blasts of Edith Piaf set the scene as much as the column bases and collapsed chandeliers. Jenny Foldenauer’s costuming captures a time period without being too specific, and Martin Carrillo’s sound design keeps the audience circled with the continuing danger outside the door. This “Antigone” has been pared down enough to be performed without an intermission, and that works too as the tension builds toward the known but still agonizing end. As director, Dean keeps the thing moving, literally, which is terribly important in a play which is mostly about fine, direct, but potentially static talk. As a result, one seems to barely breathe from start to finish – a most satisfying way to see a great and ancient work made new. 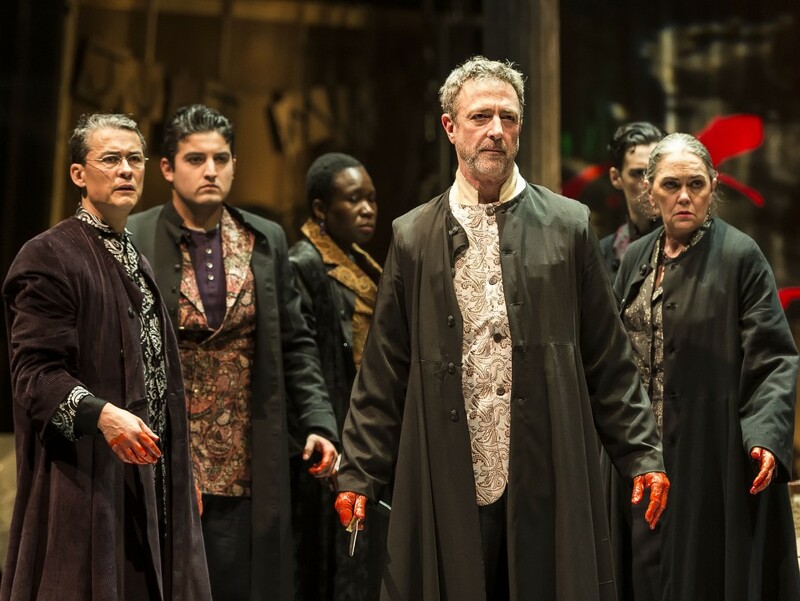 The third segment in A Noise Within’s spring repertory, a new rendition of Shakespeare’s “Julius Caesar” offers up a production extremely strong on performance, innovatively timeless in setting, and powerful in final feel. If, in the process, it has a bit of a rough – or internally derivative – start, the net result outweighs the awkward beginning. Directors love to toy with “Julius Caesar.” Its setting has proved surprisingly malleable, and has been reset everywhere from Mussolini’s Italy to JFK’s Washington. Some directors wallow in its bloodiness. Some revel in the political discourse. Some underscore the internal wrestles of people like Brutus or Mark Antony, or even Cassius. Most do some combination of the above. At ANW, co-directors Julia Rodriguez-Elliott and Geoff Elliott have chosen to at least begin the piece in an otherworldly, Brechtian way (not surprising in a repertory season also featuring a Brecht-Weill musical), but seem to abandon this somewhat as the tale unfolds. So cast members come up – as they do in the Elliotts’ other spring production, all speaking their important lines at once, don costumes hanging on stage, and then – in true Brecht fashion – hold up cardboard signs proclaiming what part they are playing. Then, things get serious, and except for continuing to use painters’ scaffolding as the set’s skeleton, we move into a separate arena. And what an arena! What makes this production work is a series of individually impressive performances which mesh in exciting ways. Robertson Dean gives Brutus both the simple faith and anguished legacy which ground his political fortunes, making him far more three-dimensional than he is often played. Rafael Goldstein turns Mark Antony into a ferociously righteous wolf, initially mistaken as boyish in this intense power struggle. Patrick O’Connell gives Caesar himself an innate nobility which makes one question the ambitions read into him more than one usually does. Still, the most fascinating role proves to be Freddy Douglas’ Cassius. Here he becomes a true, devout and unalterable revolutionary: the kind of man who fights not just on principle, but because he aims to preserve a belief (in this case, in the preservation of the Roman Republic) which is the definition of his entire world. All these fine men are surrounded with a solid supporting cast. In something as intricate as the political discussions of “Julius Caesar,” it is essential that all involved not only speak Shakespearean language as if it was native to them, but truly understand – with depth – what they are talking about. They become the translators for the general public, and here that is exactly what happens. Each person fits into their part or, in this case, parts (as the rest of the company each fill several roles), not only defining them as separate individuals but giving each a distinct understanding of the surrounding upheaval. So, in the end this is what one remembers from this “Caeser”, as the thing becomes a play of passions, and an examination of how differing passions can lead people to clash even as both can be seen (at least in hindsight) to have been right. One must mention Angela Balogh Calin’s costumes, which work hard to make almost all characters look essentially the same, in drapery deeply reminiscent of clerical cassocks. One gets the point, but the audience must strain sometimes to keep the people straight. Good thing she gives them differing colored scarves by the end, so at least we can tell which side those with multiple parts are on at that moment. So, go check out A Noise Within’s “Julius Caesar.” It plays in repertory with Charles Morey’s very funny adaptation of the Beaumarchais farce, “Figaro,” and the aforementioned Brecht-Weill “The Threepenny Opera.” Each has a distinct feel, and each will – on a certain level – leave a bit of disquiet in their wakes. The Hungarian-born playwright Ferenc Molnar had an eye for human frailty. Even at his most comic, as in “The Guardsman,” there is an underlying framework of what seems almost a pity for the foibles of mankind. Still, that doesn’t mean that “The Guardsman” isn’t also very funny, if well played. Now in repertory at A Noise Within, Molnar’s “Guardsman” aims for the silliness of it all. As many of his day did, Molnar makes ferocious fun of famous actors, in this case by playing them off each other. They are naturally narcissistic. Everything about their lives is artificial. How could they possibly search for genuine emotion, or even recognize it if it appeared? Freddy Douglas is The Actor, a well-known performer married to an actress delighted by the adoration of her fans. As their initially wild passion has faded into domesticity, he becomes convinced his wife is cheating on him, and so he decides to test her. He woos her, first with letters and finally in costume and make-up, as a military officer – a guardsman – to see if she will succumb to the charms of another. Douglas plays his character delightfully over the top, and yet with an undercurrent of elemental insecurity. His portrait of the guardsman, as obvious and ridiculous as it is, still vibrates with a kind of desperate hope. Against him, Elyse Mirto has a lovely time as the sweepingly commanding Actress. Bearing always an aura of command, she sweeps through rooms like a force of nature. Are the arguments of these two a chance to make a scene, or are they genuine? 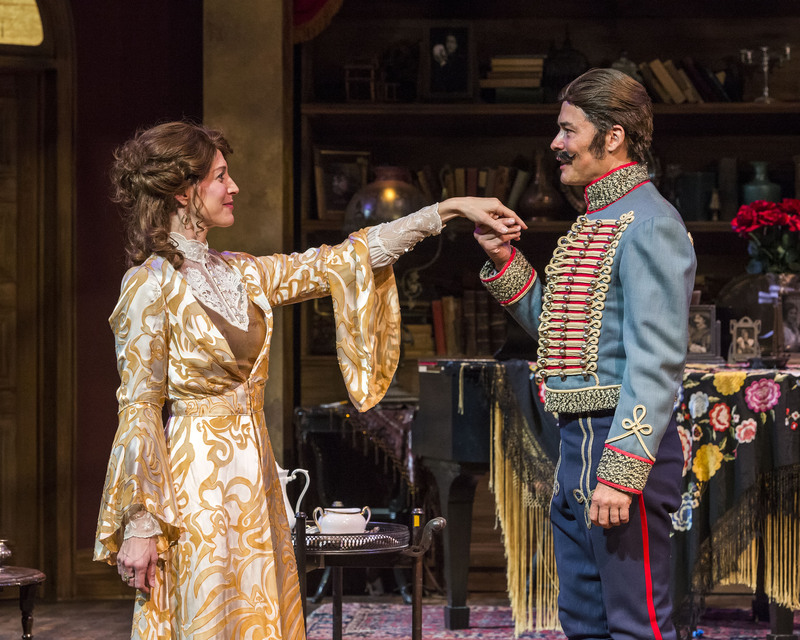 Is the actress fooled by her husband’s ruse, or is she playing him as she does the piano? Director Michael Michetti finds the balance necessary to make this production work – allowing the overly-dramatic sweeps of feeling, while keeping the humanity of his overblown characters consistently on the actor’s minds. With this, the play turns, not into farce, but into a more grounded comedy. If that sometimes make the laughs somewhat smaller, the net result is worth it. Aiding in the wild world the central characters inhabit are a fine collection of supporting players. Wendy Worthington proves practical and protective as the peasant dresser The Actress has hired to act as her mother on a daily basis. Sasha Pasternak becomes the overwhelmed innocent as their newest maid – overwhelmed by the sheer emotion flowing through the house. Todd Andrew Ball makes very funny work of the creditor always being put off by a couple delightedly living beyond their means, and Judy Durning has a brief but likable turn as the usher controlling access to The Actress’ box at the opera. Yet, it is Robertson Dean who gets handed the role most to be envied: the one voicing Molnar’s own commentaries, as the practical theater critic who has known the couple on and offstage for many years. As the one character grounded in reality, he proves the only one able to step into and out of the hyper-emotional world the others inhabit, and – as played by Dean – provides an innate steadiness which keeps righting the ship before it founders completely. In short, “The Guardsman” was never intended to be deep, but by playing it for meaning as well as for farce, it becomes something more than sheer silliness. As such, it offers fun and just a tiny bit of introspection, mystery with just a small gut-level feeling of recognition. It’s not a bad thing to get some thought with your laughter, even in a play this silly.